With the new service year fast approaching, many of us are already prepping our spiritual schedule’s and routines for the new year. While the years conventions begin to wrap up, Pioneers are gearing up for a new year of Theocratic activity & many friends are getting ready for another year of opportunities to draw closer to Jehovah. With so many fresh beginnings on the way, we thought this would be a great opportunity to create a special planner for something we all truly enjoy – Family worship! 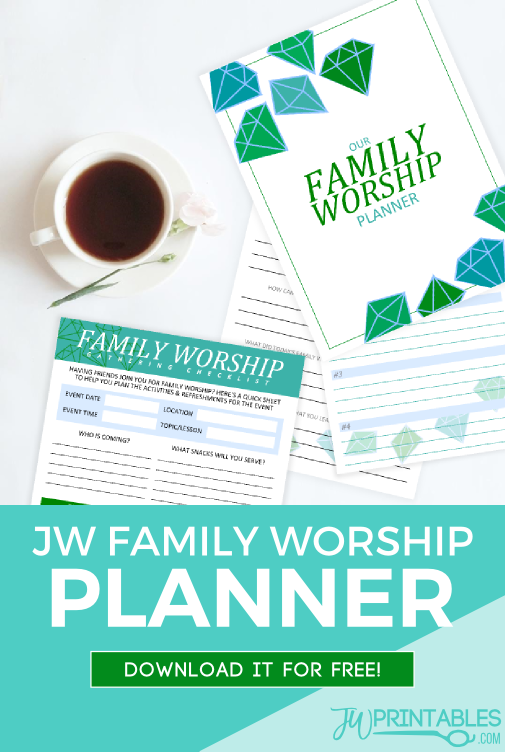 So we are pleased to upload for our brothers and sisters a free 10+ page Family Worship Planner! Your planner will likely be thicker than 10 pages, since many pages can be duplicated to suit your needs. Two versions are provided in two colors: A version for single ones and a version of families. That way all of our brothers and sisters can make use of this tool! Family Worship Review Sheets for teens, kids and small children. Family Worship Planning Sheets. Family Worship Invite Checklist. Family Worship Gathering Checklist. Weekyly schedule of Theocratic Activities. Scripture Memorization Sheets. 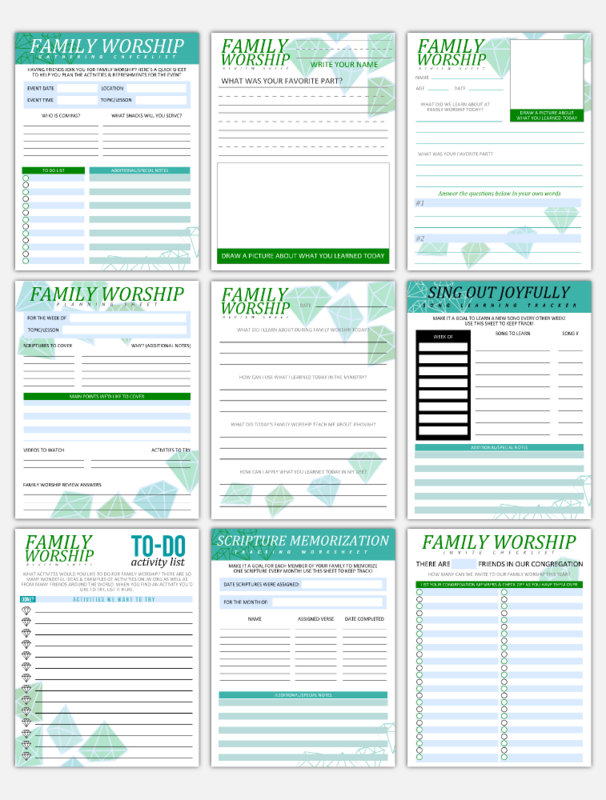 Family Worship Activity Sheets/To-Do Lists organized by subject. Sing out Joyfully Song Memorization Sheets. And way more! The ‘P’ is a button that allows you to pin an image on pinterest. It does not appear on download “buttons” and shows only on the opening image for each printable we publish. What’s oclam prep stand for? 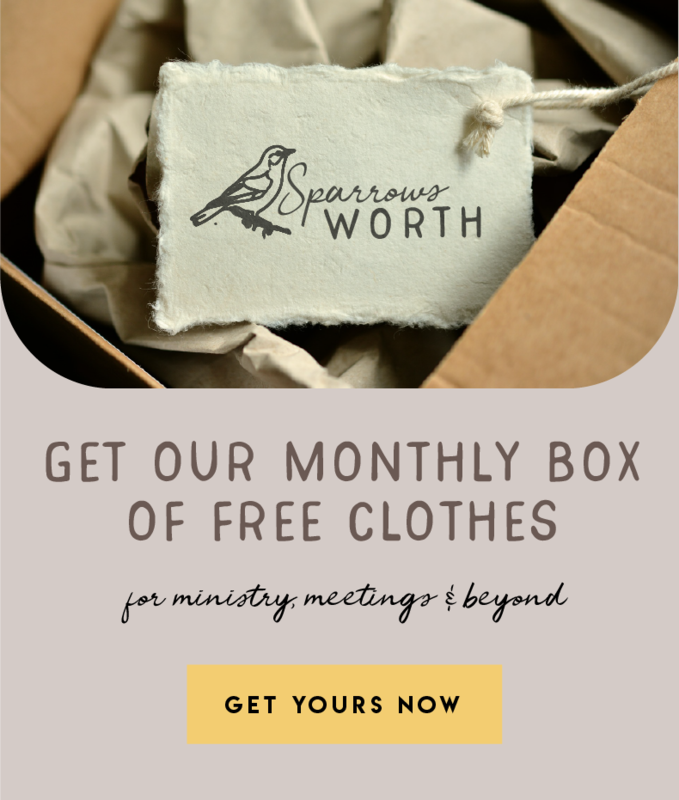 I love your printable ideas and really want to download the Family Worship Planner but when I hit the download button the Pinterest logo appears to the side but it does not download the file. Any help would be greatly appreciated. If you’re having trouble with the download button you can also click on the blue download counts which will also allow you to download the printable. Agape! Thank you for providing so many printable downloads for the worldwide brotherhood. I struggled to get my nephew to focus and listen while at the meetings. He seemed to be zoning out and into his own world most of the time when we were at meetings and I realised that he wasn’t learning anything while at the hall. Last year around August, I came around your website and I downloaded the JW meeting notes for kids (the one just up above), I printed it on carton and I gave it to him. On each Thursday and Sunday, I checked how many crosses he got from listening but there were only a few here and there; meaning that he still couldn’t focus. So then, I told him to fill only the top part of the card and to listen for “Jehovah” while at the meetings and focus on the brother on the platform. Now, the crosses multiplied and he was becoming more attentive at the meetings. Nowadays, while we prepare for meetings, he is always reminding me not to forget his meeting card! Thank you so much! Your work is helping to bring those with the right hearts to Jehovah and is directing all the glory and fame to his great name.